In most cases the bariatric centre will provide the follow-up consultations for the first two years postoperatively before discharging back to the care of the general practitioner.1 Immediately post-operatively, patients start on a liquid diet before progressing slowly onto more solid textured food. The average length of hospital stay is 2.7 days.2 Patients should expect to return to a normal solid diet between three and six weeks, although in smaller portions. The recently published United Kingdom National Bariatric Surgery Registry (NBSR 2014) data confirms that bariatric surgery in the UK has a low overall mortality (0.07%) and surgical complication rate (2.7%). 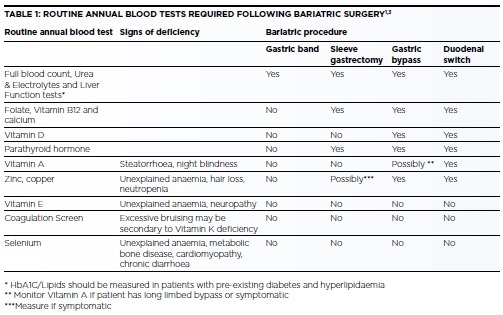 A high proportion of primary bariatric operations are carried out and completed laparoscopically (95.4%).2 These figures demonstrate bariatric surgery is as safe as most elective major operations. When patients do suffer from complications they may present with a variety of complaints, including abdominal pain, dysphagia, nausea, vomiting, reflux, infection and weight regain. Depending on the surgery carried out these may indicate development of a post-operative complications (Table 3). The British Obesity and Metabolic Surgery Society (BOMSS) has produced a traffic light system to guide GP referral back to bariatric services. Currently, plastic surgery to remove excess skin following weight loss is not funded as part of bariatric surgery. Patients are counselled to this effect preoperatively, although individual funding requests to commissioning bodies can be made for patients who experience severe complications of excess skin. The Office of Health Economics estimates that up to 140,000 people in England are eligible for bariatric surgery. It is projected that, if 5% of eligible patients were to undergo bariatric surgery, the total economic gain would be £382 million after three years, rising to £1,295 million if 25% of eligible patients underwent surgery. These figures do not include £35-£150 million per year in benefits that would be saved.13 Rising rates of obesity, demonstrated safety of laparoscopic surgery for obesity, robust evidence to support the efficacy of surgery and a strong financial incentive mean there is a strong case for bariatric surgery, even in these times of austerity. Bariatric surgery is here to stay. The NHS health gurus have increasingly realised the importance of bariatric surgery. Over the past few years, the trend has been to make obesity surgery accessible to people with lower BMIs and those with recent onset of diabetes mellitus. GPs have become increasingly aware of, and ready to refer patients to, weight management and bariatric services. As per the recent NBSR report, the morbidity and mortality rates of UK bariatric surgery are generally lower than any other national registry worldwide, demonstrating surgery to be a safe intervention. However, it remains to be seen if there is political drive to increase funding for bariatric surgery. Currently, the service is underutilised with only an estimated 1-5% of eligible patients receiving the opportunity to undergo obesity surgery. This figure can only improve and in doing so, will provide improved quality of life for thousands of patients alongside huge potential financial benefits to the health service and economy. Patient is fit enough to tolerate a general anaesthetic and surgery. 1. 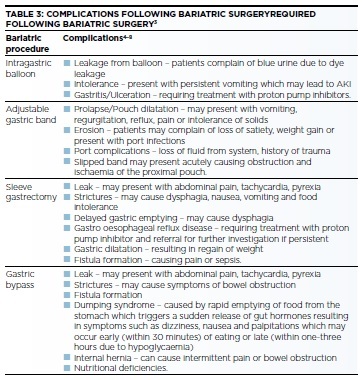 O’Kane M, Pinkney J, Assheim E, Barth J, Batterham R, Welbourn R. GP Guidance: Management of nutrition following bariatric surgery. 2014. 2. National bariatric surgery data committee. The United Kingdom National Bariatric Surgery Registry: Second Registry Report. 2014. 3. 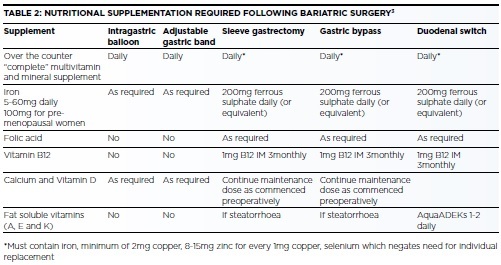 O’Kane M, Pinkney J, Aasheim E, Barth J, Batterham R, Welbourn R. BOMSS Guidelines on perioperative biochemical monitoring and micronutrient replacement for patients undergoing bariatric surgery. 4. Brown JJS, Boyle M, Mahawar K, Balupuri S, Small PK. Br J Surg. 2013;100:1614–8. 5. Frezza E, Reddy S, Gee L, Wachtel M. Obes Surg. 2009;19:684–7. 6. Tack J, Deloose E. Best Pract Res Clin Gastroenterol. 2014;28(4):741–9. 7. Genco A, López-Nava G, Wahlen C, Maselli R, Cipriano M, Sanchez MMA, et al. Obes Surg. 2013;23(4):515–21. 8. Sarkhosh K, Birch D, Sharma A, Karmal S. Can J Surg. 2013;56(5):347–52. 10. Roos N, Neovius M, Cnattingius S, Trolle LY, Sääf M, Granath F, et al. BMJ. 2013;347(f6460). 11. Colquitt J, Pickett K, Loveman E, Frampton G. Surgery for weight loss in adults ( Review ). Cochrane database. 2014;(8). 12. Buchwald H, Avidor Y, Braunwald E, Jensen M, Pories W, Fahrbach K, et al. JAMA. 2004;292(14). 13. Office of health economics. Shedding the pounds: Obesity management, NICE guidance and bariatric surgery in England. 2010.